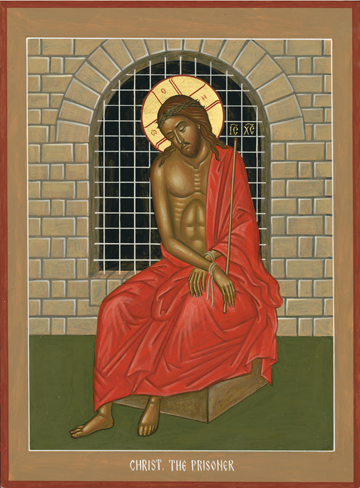 The original of this icon helps The Orthodox Christian Prison Ministry of Minnesota’s work touch the hearts of Christ’s fellow prisoners. The night before His Crucifixion, Christ was in a local prison, and is shown here as the Nymphios, or the Bride-groom, Whom we will all meet if we come to His Banquet in the Kingdom. The Church’s tradition is that the robes Christ wears in Glory are resplendent with the humility of His humiliation, mocking, beating, and Death on the Cross, and that is why the Nymphios icon is venerated on the first three days of Holy Week. At times we may forget that Christ came to teach us by His great example how to live a life filled with meekness, forgiveness, and humility. We see Christ bound at the hands, and He holds the reed of the soldiers’ derision as a scepter, the Crown of Thorns as His wreath of victory, His opened robe as the raiment of transparent humility, and His humble look as a regal demeanor of the King of Kings and the Lord of Lords, Whose Kingdom shall never end. Here is that Most Holy Peace that passeth understanding in visible form right before us! May we join Him in meekness today.